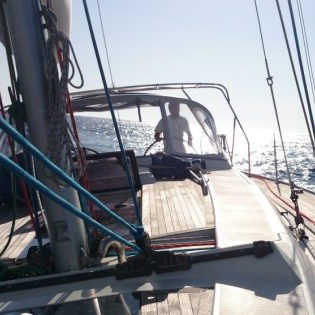 We decided to spend the winter in Las Palmas, so we could spend 3 months preparing the boat, focusing on homeschooling and taking time to practice some new positive discipline routines. We enrolled the kids in a kayak activity and we spent time enjoying the Canaries Islands hospitality. Doing boat works and living in the boat at the same time is quite challenging. Anytime that Pierre has to work on boat, he is literally taking the boat apart (in my opinion), my stress level increases because during work time the boat is a mess and I have to deal with the kids full time. We decided to take it easy, we are not in a hurry, so we are doing our best to get boat works done and homeschooling, keeping the family sane. I am continuing learning more about discipline positive. In one of my research I found an interesting google talk from Danielle Seybold and Jaclyn Long, “Mindful Approach to Positive Discipline“. I was inspired by them and I really liked their “Design Thinking parenting” approach. I have been applying design thinking for kids schooling since we started this academic year. We decided to follow the French curriculum without “official” support because we did not want to have constraints (tests on the internet, sending homework back to France or time constrains on evaluation sessions) ; we are taking the completely responsibility on the schooling for our 3 children for this year – which does not mean we’re not under supervision from the french education system. We bought the books and we kickoff the program last September! Working on what they like the most (and what we like the most to teach). We have observed the kids and we adapted our schooling to what they like (and the way they like to learn): it is making things much easier for all of us. Exploring around, visiting new places and learning from those visits. Let them discover by themselves. We have decided to let them deal with their own problems: when they are playing with others kids and something goes wrong, we let them manage that on their own (but still checking from a distance). Many times, when I see them doing dangerous things, I feel I have to tell them to stop doing that… but now I just think to myself: “Why worry, we have hospitals around here.” 😉 Kids need to experience things on their own, we try to supervise them from a distance and to not be too protective. Caring our brain animal. It is important for them to understand that they are subject to emotions (like most of us 🙂 and to be able to take the control back when strong emotions are acting in their behalf. We are still all making progress in this area. We kept a couple of hours per day (4 days per week) to focus on French and Mathematics. We also involve the kids in other (non-school) activities at the same time (like deciding on the menus for the coming week, preparing the grocery shopping list, doing the shopping, checking out the fresh water level, etc.). It is sometimes painful because they are slower than we are, but by taking it as a school assignment it is instructive and funny for them – in the long term we all win. We go out and meet new people, we enjoy discussing with the boat-stoppers and see how their dream comes true: we followed them in their boat search and during their Atlantic crossing. We discovered the island with locals, they all shared their passion. We all learnt about Canaries history. We had an amazing “mathematical” visit of Galdar with a fantastic guide. We also enjoyed all the carnival activities. We get together with other boat families. Language is not a barrier for kids when it comes to play all together. Parents have nice discussions around wine and beers. Kids have been enjoying kayak lessons. We were greatly surprised by the quality of the lessons they received, for both body and mind. We have been more than welcome in the club’s life and it has been a pleasure to be part of the CAP. You can check out what we have done so far our schooling design thinking table. 1 We started by having school whenever it was convenient: i.e. if we were on a long passage, we would not have school but when we would be on anchor we would have more school. Kids never wanted to have school, it was never a good time to work on school. We needed a strict schedule for school, while keeping a bit of flexibility (there are days at sea you really don’t want to have school!). 2 We agreed on having two hours of school 4 (or 5) days per week and also adapted sailing to school time when possible. We were following the books without adapting it our kids needs. It was easier to make them work, but kids were not committed with the programs and workload, “This is too easy, I don’t need to do it!” or “That is too difficult!“… School time was still very stressful for us. 3 We agreed with them on a 4 week program and they had to work on it during the next 4 weeks, at their own rhythm. We also observed what they liked the most to do and we adapted the program for each of them to get them maximum from them in the minimum amount of time. Kids were happier but some weeks were difficult for us, specially for me the ones when Pierre was doing boat work or when we were having visits. I had the impression of being stuck with homeschooling and daily tasks all the time whenever we could have been learning differently. 4 Instead of having a 4 week program, we changed to having a weekly program, adapting to our availability as parents and to the opportunities “out of the books” (visits, encounters, etc.) This seems to be the most convenient for us. We can balance the school work load according to our availability, activities and events. Make the kids part of the curriculum decisions, get their agreement on the weekly program. Move around the boat to give life to concepts from the books: “What kind of triangle is that between the boom, the mast and the kicker vang?” or “Is that a bolt with an hexagonal head?“, etc. Take advantage of the local places for geography and history – it’s always good to see a different point of view. Get/give feedback on what can/should be improved.